Hey, there's a road game this weekend. Looks like it is streamed on the Mountain West Network and Twitter. That is if you're not out Christmas shopping or something. So if you're still iced in at home, or otherwise homebound, watch it, and give the rest of us who won't be home a report. BSU is 5-4. They are KenPom #108. Their best win is over SMU #43. Their worst lost is to Evansville #149. Their key player is a 6'7" G Hutchison. Averaging 17 ppg, he is not a high volume 3P shooter, so I suspect he posts up on smaller guards to score (uh oh). I wonder if we'll see extended time for D'Marques again, or if a better defender like Rashad gets some time. We sure that the boys are going to be able to make the drive/flight in your weather? Don't mind me down here in the warmth. SouthCarolinaPilot wrote: We sure that the boys are going to be able to make the drive/flight in your weather? I'm sure you were just kidding...but apparently they're not able to make the trip! 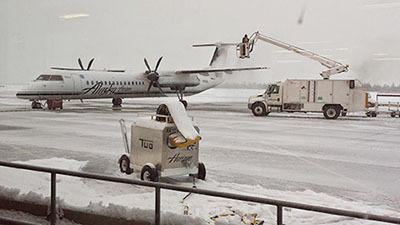 All the flights from Portland to Boise today were canceled, but now that the freezing rain has finally turned to just plain rain, there will be a couple of flights going tonight.... the problem is, there are not enough seats available to accommodate the team's traveling contingent, even if they were to only take the starting 5 and the head coach. Seems all right to me. Gives the guys more time to get ready for finals. Plus, the BSU facility is booked Sunday. Can't play during finals so maybe later, or maybe never. When was the last time the Pilots had a game postponed or cancelled? @CoachBobCantu wrote: Next up for Portland is Portland St at home Tues and at Fullerton Thur. We also are scheduling a non D1 to make up for Boise game. I wonder where in the schedule they can add another game. With a non-D1, I assume it will be an additional home game? The biggest question for me is not "when," but "why." Why schedule another non-DI game? It's just a chance for injuries, with no possible payoff. In other words, risk with no possible reward. 1) This game happens before WCC play and serves as a way to get some playing time for the reserves. 2) None of our starters play, expect maybe Hartwich (don't expose them to risk of injury). Starters should be: Ferguson, Jackson, Maker, Smoyer, Barreno. Monson, Hartwich and Hallinan come off the bench.